We have sorted through hundreds of entry’s and narrowed it down to 6 semi-finalists who will be going head-to-head each day on Studio 10. We’re a mum and daughter team who believe we should be able to enjoy our outdoor lifestyle, protect ourselves from the sun, AND feel good at the same time. We have created a range of sun umbrellas and sun parasols that give women an attractive alternative to sun protection; one that they will LOVE using. Unlike a rain umbrella, they are rated UPF50+, meaning that they block over 98% of UV rays. They have a unique cotton canopy and wooden handle, making them elegant accessories that do not detract from your overall appearance. Our new product is going to revolutionise sun safety. It is small enough to fit into a handbag, and it is incredible in the wind (we could potentially demonstrate this on TV with the use of a large fan). We have the prototype and production is going to start this week so they would be available in time for the show. The challenge for us, as a small business, is getting the word out about our brand and this fantastic new product. This opportunity would help us to show women that it is possible to protect their skin every day. We have been around for 6 years and have proven success with our current product range, with people such as Nigella Lawson and the Duchess of Cornwall using our products. We also have the systems in place to be able to handle a large influx of orders, with all orders posted the day after they are ordered and very affordable shipping options. Our brand is very popular with women aged 35+, and I suspect that they would be well received by the TVSN and Studio 10 audience in particular. We are based in Perth, however we would happily travel to take part in this amazing opportunity! My mum, Jillian, had been a nurse for 35 years and seen hundreds of women with skin cancer, but the catalyst for Sunbella was a single conversation between mum and one of her patients. In 2011 Jillian was a part of the medical team caring for a female skin cancer patient, whom was in hospital for her umpteenth surgery to the top of her head. Skin graft, upon skin graft, the medical staff were working to rid her of the disease. Anyone that knows mum knows she’s an incredibly caring and empathetic person and her bedside manner made her a favourite among patients. Whilst chatting with this particular patient in the post-operation recovery room, the lady divulged that she had spent her entire life outdoors and she despised wearing hats because they gave her hat-hair. Instead (to avoid squashing her hair) she wore a visor, which protected her face but left a good portion of her skull, neck, ears and décolletage exposed. This resonated with mum. She had always worn visors for this same reason and, inspired by her patients experience and keen to avoid the harrowing results, mum decided to purchase a sun umbrella and use it whenever possible. Google searching returned nothing but lace parasols (that were ineffective against harmful UV rays) or ostentatious umbrellas (that were an offence to the eyes), and most people would have resigned themselves to a lifetime of hat-hair. Mum, being the tenacious and determined woman she is, opted to solve the problem. She bought a couple of old rain umbrellas from the local swap-meet and dismantled them, hand-sewed a canopy using curtain-blackout fabric from Spotlight and had a handle turned from wood by a gentleman at the Mens Shed. The result was an elegant and effective sun parasol. Feedback from friends and strangers on mum’s craft project was overwhelming. It seemed to filled a gap in the market, and had the potential to change womens attitudes to sun safety. By creating an attractive, UPF50+ sun umbrella, mum had created a sun protection option for women that could be acceptable and fashionable part of everyday life, rather than a burden or daggy afterthought. Her invention seemed to turn heads for the right reasons, with family and friends asking where they could get one. Coincidentally, around the same time I left my full-time marketing gig, to look after my first baby. And together, mum and I decided that this craft project, come elegant sun parasol, was something that women could (and should) be using in our everyday lives. In 2012 we launched Sunbella, based on a philosophy that women should be able to enjoy an outdoor lifestyle safely and with style. Our inspiration hasn’t changed but our motivation has grown with the overwhelmingly positive response to our business. Things haven’t always been easy, because we’re pushing the boundaries of modern fashion. But we love a challenge and together we make a pretty good team. People are becoming more and more aware of the dangers of excessive UV exposure. And we’re able to offer a solution that negates issues of hat hair and the like. We sell innovative sleepwear that will revolutionise the way people sleep. The material is designed to help those who suffer with night sweats but wicking sweat and heat from the body and drying super quick. The sleepwear comes in a range of styles and sizes from Small through to XXL. Having spent more than a decade caring for cancer patients, over the years I noticed night sweats were a common and uncomfortable side effect of chemotherapy and radiation treatment. You can give patients tablets for nausea and for other side effects but there was nothing for night sweats..I soon noticed there were several other chronic health issues that would benefit from the product… Diabetics, sleep disorders, anxiety and depression. . . I’m now 51 and the owner of Cool-jams Australia, a rather quick growing sleep products company.. Other applications include the travel industry… Because of the nature of the fabric, quick drying with bact out technology, the popularity of the sleepwear has extended to the travel arena. Congratulations to Cool-Jams, who will be appearing on Studio 10 on Friday as our first finalist! Clutch Cardi is a compact, women’s cardigan that fits neatly inside an average size clutch purse, with room for all your other essentials. Clutch Cardi is made from eco-friendly and hypoallergenic Modal fabric, naturally sourced from the pulp of the Beechtree. It is soft and silky to the touch, ultra-light weight and with purpose designed thermal properties for added warmth. It is so durable it will not stretch out of shape. Clutch Cardi comes in its own compact custom made bag, size 10 cm x 13 cm and can be discreetly tucked inside your clutch purse till the moment it’s needed. Clutch Cardi does not distract from your outfit as it curves under your arms for minimal effect on your dress design. Never worry about the hassle of carrying around a cardigan than cramps your style or forgetting where you left it ever again. Clutch Cardi comes with easy folding instructions to fit back into its own custom bag for your next event. Clutch Cardi is fabulous for a girl’s night out, outdoor dining, formals, harbour cruises, parties and travel. When I was in Cronulla Mall one night I saw 2 young girls about 17. It was around 11pm and it was freezing. I had a jumper and coat on and wondered how these girls could brave the cold just for the sake of fashion. They were tottering on the very high heels with arms folded covering their bodies to try and retain some heat. At that point I felt that if they had something small enough and warm enough to cover them, even just in transit from one venue to the next they would be so much more comfortable…. and so the Clutch Cardi was born. The idea for Clutch Cardi was inspired by the feeling that I could never wear a strappy design once the weather got chilly as I was never one to brave the cold. Seeing girls running around at midnight in their fashion finest while the wind was howling sent shivers up my well covered spine even though I wanted to look like them. I realised that having the WOW factor sometimes meant being chilled to the bone all in the name of fashion. Going out I would see friends in their gorgeous couture only to look out and see the clouds getting darker and the temperature drop. I thought that if they had some warm coverage they could enjoy themselves so much more. A cardigan would do the trick but it kind of got in the way of elegance that top fashion brings and so the Clutch Cardi was born. Clutch Cardi is compact and made of ultra-light weight thermal fabric. It is both warm and compact. Clutch Cardi can be discreetly tucked in your clutch purse and used if the weather decides to change. Innovative indoor toilet for male dogs which is easy to clean and allows you to choose and change your own pot plant. Comes with an absorbent powder which turn when urinated on turns to an easy to dispose gel. During a stormy night of thunder and lightning, our dog Bosco huddled inside in the comfort of the laundry. When we arrived home from work, he was still too scared to go outside and had consequently peed on our laundry basket. We thought to ourselves there has to be an easier and cleaner way for dogs to use the toilet indoors! And so, The Pee Tree was born. Bosco has since passed away, however our dog Banya and many of his canine friends have thoroughly tried and tested The Pee Tree, making it the perfect solution for indoor pet toileting. After initial idea researched the pet industry to see if any such product existed to address the problem in a better way. After being disappointed with the options available, I developed a prototype of the product, created The Peetree Company and am now ready to go to market. Congratulations to Clutch Cardi, who will be appearing on Studio 10 on Friday as our second finalist! Due to event in Hong Kong of SARS that caused the death of many people, I wanted to find a simple, worry free solution that was affordable and could be implemented in old or new buildings. 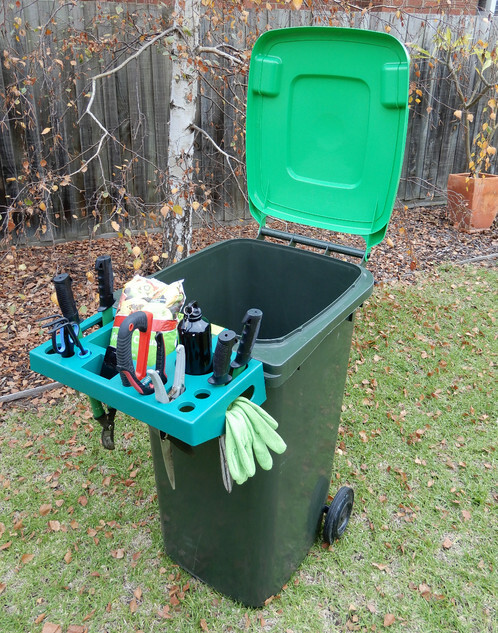 The Vass caddy garden sits easily on the green recycle bin whilst storing all necessary tools. The caddy then can be stored back in the shed on the Vass garden wall bracket without removing all the tools. No other product like this on the market. Most common problem is everyone misplaces their tools whilst gardening. The Vass garden caddy is designed to keep all gardening tools together. Congratulations to Vass Garden Caddy as our third finalist! Congratulations to Vass Garden Caddy as the winner of Your Grand Idea! Bill will be appearing on TVSN on Saturday 28th of April! Next: Next post: Welcome to the Family!